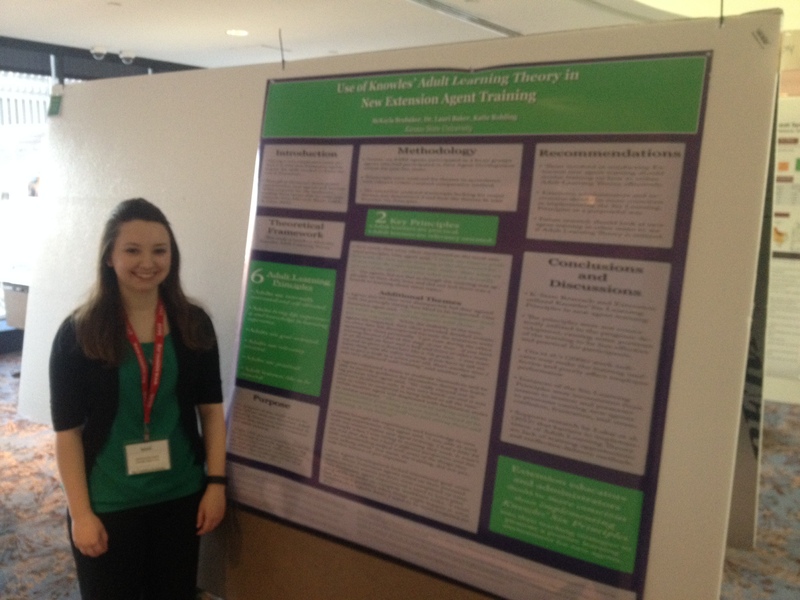 McKayla Brubaker, senior (ACJ), poses with the research poster she created and presented. As a small-town girl, my trip to the Southern Association of Agricultural Scientists (SAAS) Conference in Atlanta was quite an adventure. Despite my shy and nervous nature, seeing the city and learning about research conducted by graduate students and faculty across the region was a great experience. I shared a poster about my undergraduate research findings from my work with Dr. Baker. My poster involved analyzing new extension agent training and development, to see if the Adult Learning Theory was used in the training process for new hires. Being involved with research has been a pleasant surprise for me. I have come to enjoy research, especially sharing results with others. In the end, it was worth it to step out of my comfort zone and present at SAAS. This experience has allowed me to grow as an individual in ways I never imagined. Throughout the conference, I networked with graduate students and professionals. We toured the Georgia Aquarium, ate dinner at a Turkish restaurant (complete with a belly dancer), and attended the SAAS Super Bowl Party. Attending SAAS allowed me to get to know the department’s graduate students better, fine-tune my research skills, and ultimately, learn more about myself. While this small-town girl didn’t quite belong in the big city, it was a valuable experience, making memories I will cherish for a lifetime.